Great overview of "history from below" for the various not-officially-sanctioned workers in the Atlantic from the 1600s to the mid-1800s. This was just the book I wanted. I could see someone reading it and thinking, hm, these chapters are just quick, breezy overviews of really complicated and deep topics. And they are! But if you want more, pretty much any chapter is a concise, readable summary or extract from a full book by Rediker. You want more? Go get it!Of especial interest if you're looking for historical examples of emergent social orders outside nation-state contexts. It's also a decent bet that you haven't really had it laid out for you just how influential the workers on the sea were to the various emerging forms of society in the 1600s-1800s. Again, this is a great place to start. Thank you to the publisher and marketing at Beacon Press for giving me the opportunity to win this in a Goodreads giveaway.The book is extremely well written, researched and documented. The language will appeal to the non-history buff as well as those of us used to stuffier tomes. Rediker's writing is brisk and smooth, though sadly prone to some level of repetition. Perhaps this is due to finding less to write about in the source materials than he expected or due to a desire to hammer concepts home. The title is a bit of a misnomer, in my opinion, I was expecting there to be more than just one chapter on pirates based on the "Outlaws" in the title.Structurally the book is grouped into Sailors, Fugitives, Pirates and Slaves. The sailors chapters were a little repetitive and probably could have been a couple pages shorter, particularly in the part about sailor's yarn: I grasped the concept of storytelling as a medium for spreading information on the first mention. The fugitives chapter read like an adventure story making it a quick breezy read that left a lingering taste of salt in my mouth.Rediker is far more sympathetic to pirates than David Cordingly, who has spent several books attempting to smash the romantic image of piracy in the public's mind. This was the first time I'd read of the anti press gang movements and their links to the thinkers who began the American Revolution. I would like Rediker to write more about piracy, it's motivations and the way that it's ideals of "liberty" affected the thinkers of the second half of the 18th century. That part of the book was extremely interesting and thought provoking.The first chapter on slave ships felt shoe horned in and should have been subtantially shorter. While it was very interesting and well written, most of it felt outside the scope of a book about sailors and it brought the pace of reading to a hasty full stop. As a set up for the chapter on the Amistad Rebellion, it really only needed to be a few pages. It interrupted the flow of thought from pirates to the overtaking and seizing of the Amistad as an act of piracy or an act of self defense. The sentence "The main cause of slave revolts was slavery" has to be one of the worst DUHH moments I have ever seen in a serious work of history. What editor did not catch thatand insist on it being reworded to something that didn't sound quite so grade school essay. The whole paragraph was interesting in the failure of people at the time to grasp the concept of revolting but probably needed to be a foot note instead.On the whole I enjoyed the book very much, it was easy to read, interesting, full of information and ideas to think about and I would recommend it to anyone interested in the lives of sailing men prior to the mid 1800s. 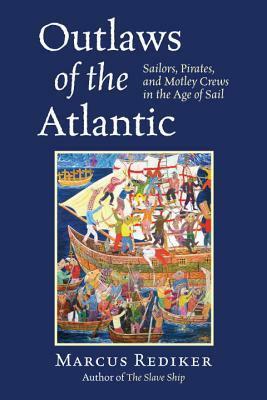 The common man, whether he be a sailor, a slave, or a pirate is the focus of Marcus Rediker’s “Outlaws of the Atlantic”. Rediker shows how the lowest individual influenced not only the culture of their day, but shaped the world into what it is today.Through seven essays Rediker looks at how the daily lives of individuals who worked the Atlantic’s waters, both willingly and unwillingly, and how their experiences affected their own time and ours. The first was the common sailor who informed “men of learning” who only went to the docks about the all the new places opening up to the European mind. The next was following the career of a individual sailor who left a memoir of his experiences, showing the ups and downs of an average sailor’s life. The sailor’s response to his life took many forms, some of which was social revolution in various forms. Other individuals who lived below decks were those who did not want to be there, either convicts or enslaved individuals, who responded to their predicament by trying to escape by either running away or willingly ending their life.Throughout the book, the term “motley crew” is used by middle- and upper-class individuals throughout the time period of Rediker’s history. As the author explains, this was term used for a multiethnic crew of individuals. These motley crews were involved in many “rebellions” or violent protests against what they saw as unjust practices or laws, many of these were connected to the various protests of the late 1760s and early 1770s leading up to the American Revolution. As Rediker explains, the more well-known Sons of Liberty organizations were formed to present a better image than the low class and mixed crews.The most informative sections of the book featured the life and public views of pirates. Rediker details how and why piracy occurred as well as the counterculture it fostered away from the expected one that English foreign and economic policy demanded. The most surprising element was how the Amistad Rebellion’s public reaction was influenced by the newly “romantic” image of the pirate in popular culture.Upon finishing “Outlaws of the Atlantic” the reader has a better understanding of how the common man experienced the age of sail, either willingly or unwillingly, and how it still influences our world today. Rediker’s essays make the reader want to know more about certain events he covered because of his thorough research and writing style, and luckily for Rediker he has written some of the books those readers could be exploring to learn more about sailors, or pirates, or rebel slaves. I highly recommend this book to anyone wanting to learn about how life was for the majority of individuals who call the sea home during the “Age of Sail”. First of all this was a book I received through the Goodreads First Read Giveaway. I was hoping for a little maritime history with some good sailing stories of high seas adventure. I found that this book was actually much more than a bunch of stories about pirates (although that in itself would have been enough to keep me happy). The author actually uses the history of the sailing world to show that the sailing world was a catalyst for growth and incredible change in the political and economical world. He used some well known groups and individuals in the sailing world to not only create a vivid and thoroughly engrossing picture of the age of sail but also to show the importance and even fundamental role they played in shaping the history of the world as we know it. I definitely enjoyed it, something a little out of the ordinary but well worth the read. Disclaimer: I received this book as a Goodreads giveaway for the purposes of this review. No other compensation was offered or requested.During the Age of Sail, the deep ocean sailing ship was one of the most advanced technological wonders of its time. But such a complex device required many workers to keep it running smoothly and keep it from collapsing in times of danger. So there rose the class of people known as the common seaman; sailors who were essential to the ship as a group, but entirely replaceable as individuals.Often ill-used, to the point that they often compared themselves to slaves, sailors developed their own subcultures and began “resistance from below”; most notably creating the “strike” when an entire harbor’s sailors struck (took down) the sails of the ships they were on and refused to work until they got better conditions. Sailors became both the creators of and spreaders of rebellion against the cruel social order of their day.Mr. Rediker is a professor of Atlantic History at the University of Pittsburgh, and this is a collection of short pieces he’s written on the general theme of “resistance from below” as it relates to the Atlantic Ocean in the Age of Sail. He talks a lot about “antinomianism” (the idea that one is primarily saved by faith, rather than obedience to law), and “hydrarchy” (rule by the sea, often connoting rule of the lowly many as opposed to the official hierarchy).The book begins with an examination of “the sailor’s yarn” and how it was used to spread information both useful and dubious, influencing Western literature among other things. It moves on to the stories of two men that demonstrate that history also includes ordinary workers and castaways.In an essay on pirates during the Golden Age of Piracy 1650-1730, emphasis is laid upon the efforts of pirates to democratize their ships; pirate captains were limited in authority, unlike merchant or military captains whose word was law, and whose punishments were untempered. This indeed was one of the reasons pirates found favor in popular culture; for all that they were criminals, they also had a kind of freedom seldom seen at the time.There’s another essay on how “motley” (multi-ethnic) crews of sailors helped spread the ideas that led to the American Revolution; though the wealthy stepped in to keep the Revolution from going too far towards mob rule as they saw it.There is a chapter on slave rebellions aboard the ships carrying them to the New World, usually doomed, and a separate chapter for the case of the Amistad, which turned out much better than could have been hoped. The latter chapter looks at how conflating the Amistad freedom fighters with pirates helped influence American attittudes towards the men from Sierra Leone.There are several black and white illustrations, copious endnotes and an index.This book very much feels like an introduction to the theme of rebellion in Atlantic Ocean history, and as such I would recommend it to the casual student looking for a quick read on various aspects of the subject. Professor Rediker’s other books appear to go into much more depth on the individual subjects involved, such as slave ships and piracy. Based on his work here, those should also be interesting.If these sound like topics you’d be interested in, check your lending library system to see if they’ve got this book in stock. Outlaws of the Atlantic: Sailors, Pirates, and Motley Crews in the Age of Sail by Marcus Rediker (Beacon Press, August 2014, 248 pages, $26.95/14.55) is a carefully written and meticulously documented history of how the social revolution of the past four centuries was fomented from below decks by sailors of all kinds. Perhaps disturbingly for some, it turns history as most of us are used to seeing it on its head by crediting the democratic and independent move towards revolution and freedom as originating and being powered from below. Those of us used to “great man” or “great events” views of history will find this book to be disorienting at first, However, as Rediker compiles his evidence that the sea was the ultimate source of freedom from the restraints of conventional hierarchy and lawfulness, and that the discovery of this grew from the treatment of the men (mostly) who plied the waves, the picture of the forces of freedom and independence coming from below makes increasing sense. At times the book seems to jump around in time, as Rediker selects incidents and actors in his drama of human discovery, but the ideas become increasingly palatable, if not self-evident, as the narrative runs its course.Many of us have bought whole hog the story of the power and benevolent spread of civilization by dint of the spread of British sea power. The use of impressment, that is, the virtual legal kidnapping of farmers, fisherman, and workers of the streets and away from the farms of England to provide fodder for the crews of the British naval fleet from the seventeenth through the nineteenth century, has been mostly seen as a necessary evil. Either ignored or misunderstood, are the land-based riots and the ship's revolts by those forced into service at low pay under extremely harsh and dangerous conditions by both naval and commercial ventures. Riots undertaken largely by lowly workers in seaports and on board ships were greatly feared by ship's masters and municipal authorities, whose power was augmented by local and naval sanction...read the remainder of my review on my blog. If you wish to purchase this title, please consider ordering it through the Amazon portal there. Full disclosure: I received a free copy of this book through a Goodreads giveaway.Outlaws of the Atlantichas some fascinating insights about sailors, pirates, and nautical culture during the Age of Sail. Sailors maintained a culture and community all their own, which no "landlubber" could ever hope to understand. Oftentimes, men in the navy were "impressed," or compelled to serve, with little hope of reaching home and family again; because of this, the other men became a surrogate family during their long imprisonment.The book gives us a tantalizing glimpse of the thriving pirate communities that grew out of the freebooters' motley (multiethnic) crews. Pirates lived by a strict ethical code and would brook no mistreatment of sailors on any ship they overtook; only if his men vouched for his kindness could a captain survive. The egalitarian communities pirates formed aboard ship made them seem attractive to many, including escaped slaves.To me, the strongest portion of Outlaws of the Atlanticis that which tells of the influence the motley crews had on the American Revolution. Crispus Attucks, known to us today mainly because of the manner of his death, was an Afro-Indian sailor in whose name John Adams once ghostwrote a letter about liberty. The founders of the revolution were inspired by the motley crews, but eventually turned their backs on the crews' ideal of equality between men of all races.While the book was an entertaining read, it ultimately left me a little frustrated because I wanted to know more about the people and the events it discussed. As an overview, it's fine, but I would have liked to see more development of the idea that pirates and motley crews "worked together to subvert capitalism." It's always interesting to read history from a new perspective. Outlaws of the Atlantic certainly provides that with a view of the Atlantic in the golden age of sail from the eyes of "Jack Tar." Like reading about the Civil War in the diary of Sam Watkins, learning about the history of sailing and piracy from the perspective of an average sailor is both fascinating and enlightening. It's easy to forget that while politicians, generals, admirals and the like may have their names featured more prominently in history books, history itself is effected by millions of average people.Rediker does a very nice job of presenting that perspective for sailors and pirates in text that is both informative and engaging. There are a lot of fun surprises along the way, too. Learning about the democratic, egalitarian nature of pirates and pirate vessels was far different from the Hollywood portrayals we've all seen. Frankly, it was fascinating. I do wish that there had been a few more direct quotes presented in the text. The notes are replete with sources of "bottom up" perspective, though, and I plan to seek some of them out for further reading.In the end, I can highly recommend Outlaws of the Atlantic to any history buff with an interest in the golden age of sail in the Atlantic. It's a great read from a new perspective that is sure to engage the curious reader. First of all my thanks to Goodreads and the publisher for my Firstreads copy.Rediker has tried to convey a grand thesis in a very small book. He approaches the idea of the "Motley Crew" as the true foundation of historic events. This is obviously true as without the average sailor the boat doesn't sail. He does make some presumptions and the book is a bit esoteric at times but he does a good job in painting a portrait of how information and ideas were transmitted in the age of sail. The book is entertaining but does lean a bit heavily on anecdote.My biggest issue is with some of his conclusions which seem based on assumptions at times. One of the worst examples is on page 117 where he talks of how veterans "may have led a series of revolts" that accelerated revolution in Europe. He also states as fact that the motley crew was the source of Sam Adams belief in all people being "on a level born with a share of freedom".Aside from taking issue with some of Redikers presumptions and his drive to point towards anti-capitalism as motive I found this book to be well written and informative. Historian Rediker's collection of essays delves into the history of piracy and such from his usual "history from below" angle, telling the story of common people (who sometimes do uncommon things). The thesis here is (1) that the sea, rather than just "between places" place, is somewhere history and culture could itself be made and (2) that the fluid (pun intended) societies at sea often inspired what we'd now call social-justice movements and attempts at self-government. Especially notable are his depiction of pirate societies as highly democratic and his assertion that sailors' calls and actions for freedom and justice were a big influence on the American colonists who rebelled against England. There are two things that I really hate when I read history: first, I hate it when an author exaggerates the importance of his subject, particularly by taking a generally-unknown event that has some link to a famous event and claiming that the minor connection is of incredibly importance; second, I hate Marxist interpretations of history, since any historian who follows Marxism hasn't really learned the lessons of history.Unfortunately, this book has both of those. Rediker unconvincingly tries to demonstrate that the ideas of the American Revolution originated in piracy and mutiny. He also makes the entirety of maritime history in the Age of Sail into a class war between the proletarian (a word he uses frequently) sailors and their elite captains/officers. I finished this book two days ago and have been conflicted about writing a review. I was tempted to adopt the Thumper philosophy from Bambi, "If you can't say sometihin' nice, don't say nothin' at all." I walked into my first history class in college and Dr. Alan Breck opened his mouth and I was hooked. The man made history come alive and he required us to understand the "why" of history, not just memorize names, places and dates. I ended up with history as part of a double major. If Dr. Breck had lectured like Marcus Rediker writes, I would have been like most kids today - would rather have a root canal than have anything to do with history. I found the writing pedantic, filled with biases and broad sweeping conclusions based on scanty evidence. Enough said. ** I won this book in a Goodreads giveaway. **"Outlaws of the Atlantic" is a perspective-changing look at pirates, outlaws, and enslaved Africans upon the Atlantic Ocean from the late seventeenth century to nineteenth century.Author Marcus Rediker's account is a bottom-up history -- showing how we commoners shaped history. The book is both scholarly and readable, and the primary sources Rediker draws upon fascinated me. Recommended. Marcus Rediker - I was born in Owensboro, Kentucky, in 1951, to Buford and Faye Rediker, the first of their two sons. I come from a working‑class family, with roots in the mines and factories of Kentucky, Tennessee, and Virginia; I grew up in Nashville and Richmond. I attended Vanderbilt University, dropped out of school and worked in a factory for three years, and graduated with a B.A. from Virginia Commonwealth University in 1976. I went to the University of Pennsylvania for graduate study, earning an M.A. and Ph.D. in history.I taught at Georgetown University from 1982 to 1994, lived in Moscow for a year (1984-5), and am currently Professor and Chair in the Department of History at the University of Pittsburgh.I have, over the years, been active in a variety of social justice and peace movements, most recently in the worldwide campaign to abolish the death penalty.I am, by ancestry, Welsh, Scottish, Dutch, and Cherokee; I am, by upbringing, a Southerner; I am, by generation, of the New Left; I am, by choice, a citizen of the world.I have written (or co-written) five books: Between the Devil and the Deep Blue Sea (1987), Who Built America? (1989), volume one; The Many-Headed Hydra (2000), Villains of All Nations (2004) and The Slave Ship: A Human History (2007). It has been my good fortune to lecture throughout the United States and abroad, in London, Paris, Amsterdam, Milan, Moscow, Sydney, and Tokyo; to have my writings translated into French, German, Greek, Italian, Korean, Portuguese, Russian, Spanish and Swedish; and to hold fellowships from the John Simon Guggenheim Memorial Foundation, the National Endowment of the Humanities, and the Andrew P. Mellon Foundation. It has been my much greater good fortune to be married to Wendy Z. Goldman, a professor of Russian/Soviet history at Carnegie Mellon University. We have two children, Zeke and Eva, and a bulldog, Jellybean.